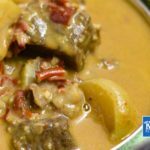 Our Low Carb Beef Massaman Curry is a rich and mild curry, infused with the exotic flavors of Thailand. Place the dried chili in a heatproof bowl, add the boiling water and set aside to soak. Toast the coriander, cumin, cardamom and cloves in a dry frying pan over medium heat. When fragrant, add to your mortar and pestle. Grind the spices for 2-3 minutes before adding the peanuts. Continue to grind until it is a fine powder. Drain the chili and place into your food processor, along with the onion and garlic. Blend well, until all the ingredients are finely chopped. Add the spice mixture and blend until the ingredients resemble a paste. You can add a little water if the food processor is struggling to blend. Place a large saucepan over high heat, add the oil and brown the diced beef in batches then set aside. Once all the meat has been browned, add the paste to the saucepan and saute for 15-20 minutes, until fragrant and cooked through. Return all the beef to the saucepan and stir through the paste. Add the coconut cream, bay leaves and cinnamon quill and simmer partially covered for 1 ½ hours, until the beef is very tender. Add the radishes and simmer for another 10 minutes. Taste the curry sauce and season with the erythritol and fish sauce to your preference. Remove from the heat and serve with a side of Coconut Cauliflower Rice.